Other than posting in Facebook support groups and talking to a few family members, I have not “come out” about my choice to do IVF. I have been open about having secondary infertility since my daughter died of SIDS in 2003. But I have not publicly discussed all of the treatments I have undergone during the intervening years. However, a reader of my post, “10 Things I Wish Someone Had Told Me About Infertility” asked me to talk about my infertility journey on her new podcast. Specifically, she was interested in what steps I was now taking in trying to conceive. Her request was actually quite timely, because I had just done a frozen embryo transfer last week. But to share this information in a public forum means taking a risk and overcoming a number of fears in the process. Why am I “afraid” of talking about my IVF experiences? Oh, let me count the ways. First of all, I am afraid of disappointing or alarming people who care about me. Going through infertility treatment is difficult, but most people are aware that IVF is a challenging form of assisted reproduction. On top of this, I have bipolar disorder, which only amplifies my loved ones’ concerns. Because of this disorder, I know my loved ones have concerns about any infertility treatments interfering with my psychotropic medications. In the past, Clomid –which jumpstarts and amplifies ovulation — did impact me negatively. At best it made me an emotional wreck; at worst it triggered a full-blown psychotic break which sent me to the hospital. Fortunately, the hormones given during IVF bypass the brain to affect the reproductive organs directly, leading to very few emotional side effects for me. However, I know this information doesn’t stop people from worrying. I appreciate this concern, but worrying about other people’s feelings while also going through IVF is difficult at best. I am also afraid to share my IVF experiences because I vowed a few years ago that it was one type of treatment I would never do. I am afraid because it means having to do a lot of explaining about a subject that is emotionally difficult to talk about with others. Doing IVF was actually a decision we considered when I was 35 (I am 40 now), but chose not to because of my husband’s ethical concerns due to his Catholic background. I appreciated his way of thinking and, even though I could see it from a different perspective, agreed we shouldn’t “play God” with IVF. As the clock ticked on, however, my husband’s judgment softened. Especially when we were told by a specialist that my chances of conceiving without IVF was less than 1%. This was because adhesions had reformed after a surgery to remove endometriosis and old scarring. So, at 39 years old, I decided to go back to the doctors at the IVF clinic we had consulted with four years earlier. They outlined a treatment plan and I was all set to have my first cycle start at the beginning of last August. Unfortunately, my hypothyroidism turned out not to be under control and we had to wait until it was before we could move forward. This took until December. They retrieved 10 eggs, all of which fertilized; we decided to implant two embryos and five survived long enough to be frozen. This is the other reason why I am afraid to tell people about my IVF experiences: I got pregnant during that first IVF cycle, but it ended in a really early miscarriage that is common in assisted reproduction — called a chemical pregnancy. I didn’t want to have to tell people about one more loss. I didn’t want to hear anyone wonder why I was putting myself through this grief. Or why I couldn’t just be happy with the life I had and avoid this kind of pain. So, after this miscarriage, I decided I was going to move forward with a frozen embryo transfer. But I was not going to tell anyone about it- – except for my husband, who kind of needed to know! At this second embryo transfer, we were told that the two embryos (see ultrasound picture above) we were defrosting were beautiful, already hatching and ready to implant. This time, the transfer went much more easily than with the first, with Valium and experience helping me through it. But I was still afraid to let anyone publicly know about this IVF experience. Now, I am again in the dreaded two-week wait. My husband accidentally told my mother and so I have since opened up about the transfer to a few family members. But I am still wary of sharing too much with too many people. So, why have I decided to open up a little bit about my IVF experiences so publicly despite my fears? The first reason is because I have been asked to. The second is that I know being open about my infertility has helped and inspired a number of people. There is a possibility that my sharing a bit about my IVF experiences might also do the same. I am still afraid to share much about my IVF experiences, and it will probably take me quite some time to overcome my fears. 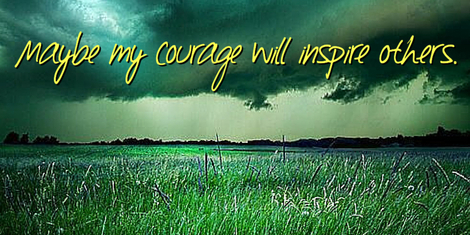 But maybe this exercise in courage will have a positive effect on others who are on a similar infertility journey.